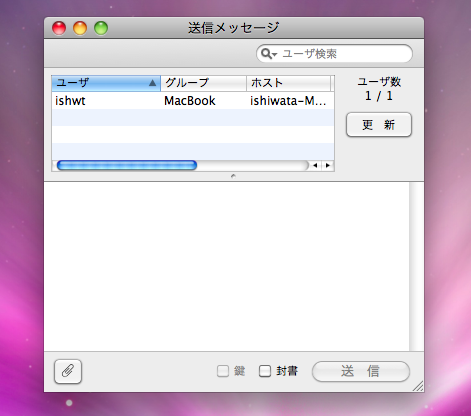 “IP Messenger for MacOS X” is a pop up style message communication software for multi platforms. It’s a port of Windows Version. Maintenance release for Gatekeeper in OS X 10.9.5 or later (include 10.10 Yosemite). IP Messenger is now Version2 Developer ID-signed Application. Maintenance release for Gatekeeper in OS X 10.8 Mountain Lion. IP Messenger is now Developer ID-signed Application. Added User search field on Send Window. 0.10.0 supports Mac OS X 10.5 Leopard or later. This software is licensed according to the BSD Licence. Neither the name of the G.Ishiwata nor the names of its contributors may be used to endorse or promote products derived from this software without specific prior written permission. THIS SOFTWARE IS PROVIDED BY G.Ishiwata ”AS IS” AND ANY EXPRESS OR IMPLIED WARRANTIES, INCLUDING, BUT NOT LIMITED TO, THE IMPLIED WARRANTIES OF MERCHANTABILITY AND FITNESS FOR A PARTICULAR PURPOSE ARE DISCLAIMED. IN NO EVENT SHALL G.Ishiwata BE LIABLE FOR ANY DIRECT, INDIRECT, INCIDENTAL, SPECIAL, EXEMPLARY, OR CONSEQUENTIAL DAMAGES (INCLUDING, BUT NOT LIMITED TO, PROCUREMENT OF SUBSTITUTE GOODS OR SERVICES; LOSS OF USE, DATA, OR PROFITS; OR BUSINESS INTERRUPTION) HOWEVER CAUSED AND ON ANY THEORY OF LIABILITY, WHETHER IN CONTRACT, STRICT LIABILITY, OR TORT (INCLUDING NEGLIGENCE OR OTHERWISE) ARISING IN ANY WAY OUT OF THE USE OF THIS SOFTWARE, EVEN IF ADVISED OF THE POSSIBILITY OF SUCH DAMAGE. Fixed an issue that the confirm dialog was displayed each time you launch the IP Messenger if the firewall is enabled. Changed that the default preference value of log file output is enable. Changed the default preference value of log file path. Fixed an issue that user list and attachments becomes invalid when log file conversion failed. Fixed an issue that does not work with the logging check box and related UI components. Placeholder string of search field changed to vary according to the search categories. Fixed issue that new item might not be added to “Broadcast over the LAN settings”. Added converting log file to UTF-8. Automatically save resized window size. Write log file with UTF-8 encoding. Removed LogOnName and HostName from preference panel. Removed new line code setting for log file from preference pane. Reduced function of fixed window position. Fixed issue crashing at startup in some network environment. Removed support for AppleTalk hostname. Fixed compile warinings in Xcode with 10.5/10.6 SDK. Changed Xcode project compatibility from v2.4 to v3.0. Changed Nib format to IB3.0. Immigrate DevelopmentTools from ProjectBuilder to Xcode. Fixed bug that two self user are displayed in the user list on Intel Mac. Deprecated APIs in Mac OS X SDK 10.4 make not used. Changed URL of support site in Help menu.